I should get out more. : What's wrong with this picture? 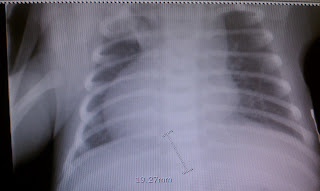 This patient has situs inversus. It is a mistake in embryogenesis where the major organs in the body end up in a mirror-image position from where they should be. On medical images, the right is on the left and the left is on the right. So what you see in this chest x-ray is a heart that extends to the patient's right side. It is normally the opposite, of course.